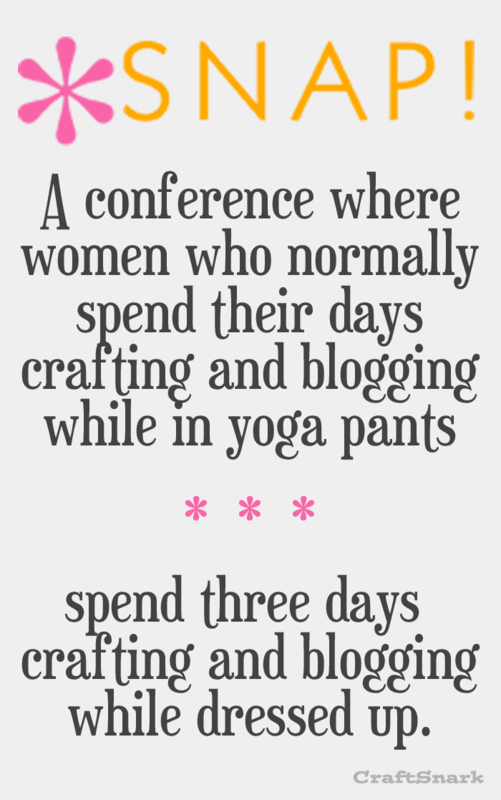 Craft Snark: What is the SNAP Conference? What is the SNAP Conference? Bloggers all over Crafty Blog Land are preparing to go to SNAP the Conference next week. You might wonder what the conference is, what it means... and really, what the fuss is all about. I get to go, and I am super excited. To be surrounded by hundreds of creative minds, to be able to talk to others who understand the insanity of blogging while trying to juggle a dozen other things. To have an excuse to put on something other than sweatpants. And to put on makeup without worrying that my preschooler's crisis will distract me mid-eyeliner, causing me to walk around with a half made-up face most of the day... because I never made it back to the mirror and forgot what I was in the middle of when I got distracted. Because that never happens to busy moms with two kids. Really, SNAP is going to be something different for every person who comes - each of us will put into it and get out of it something different. Like our own little version of awesome. Will I be seeing you there? LOL! Yes! I'm so excited! LOVE IT! This is so me! This is cute :) I'm going for the first time this month - I'm looking forward to it!